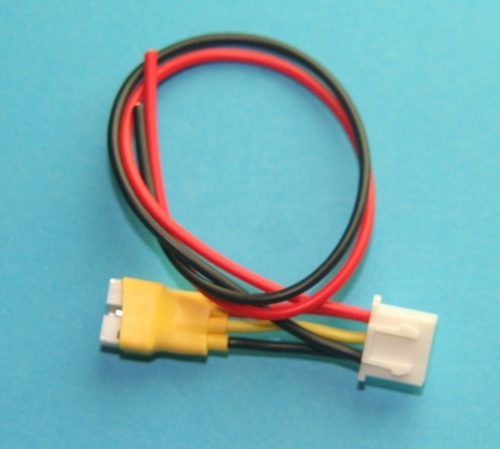 The JST-PH connector is used on many high current micro ESC and LiPo batteries - e.g. the E-flite Blade mCPX helicopter, the Spektrum AR6400LBL receiver and several Parkzone, E-Flite 'UMX' models. Several single cell and 2S LiPo batteries are now available with JST-PH plugs. 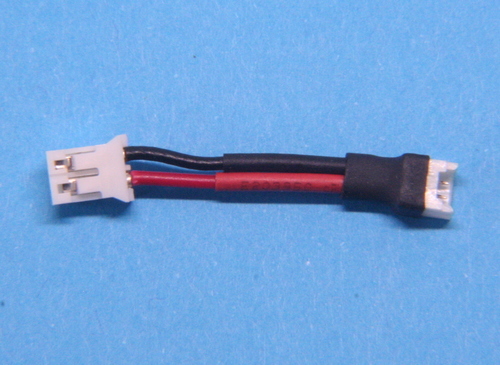 The 2 pin is used on 1S LiPo where the discharge current would exceed the safe limit for a 'UM' connector. 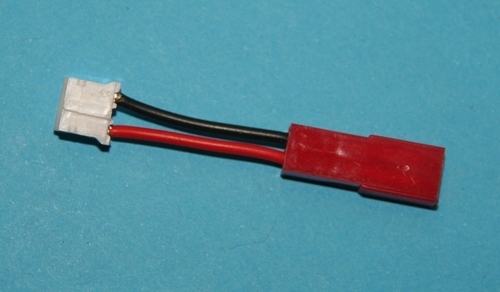 The 3 pin is used on 2S LiPo to eliminate the need for separate discharge and charge/balance connectors. TAKE CARE: the convention for wiring these connectors has the positive and negative wires on opposite sides when comparing the 2 pin and 3 pin - see connector wiring for details. A 5 pack of 2 and 3 pin JST-PH plug shells and crimps. Both packs contain 5 spare crimps for you to practice attaching them to wires. The 2 pin plugs are the same as used on 1S batteries for E-flite UMX models - e.g. the Blade mCP-x. The 3 pin plugs are increasingly used on small 2S LiPo batteries for dual use as power and balance connector. The crimps can be attached, with care, using a standard 0.1" servo connector crimp tool or a pair of serated jaw needle nose pliers can be used. Soldering should be avoided as it is very easy to get solder into the spring connector part. A 5 pack of 2 and 3 pin JST-PH sockets. 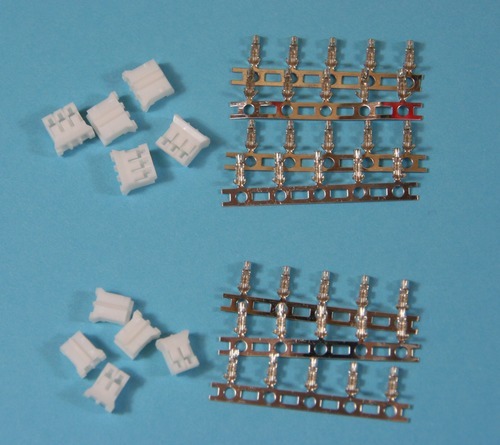 The 2 pin sockets are compatible with the plugs used on 1S batteries for E-flite UMX models - e.g. the Blade mCP-x. The 3 pin sockets are increasingly used on small 2S LiPo batteries for dual use as power and balance connector. 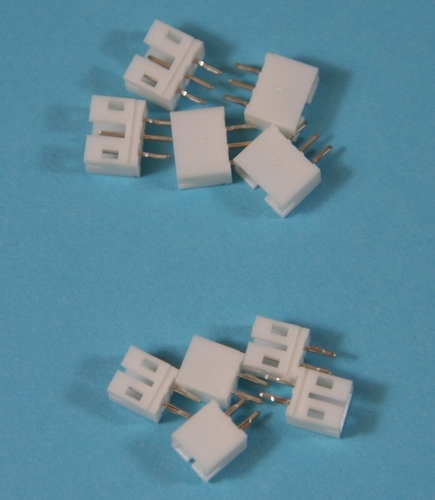 These are PCB mount connectors with solder pins, wires can be attached by soldering to the pins and protecting with heat shrink sleeve. 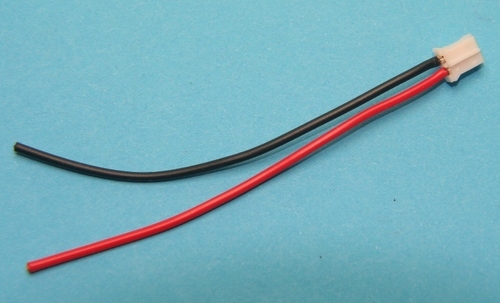 These leads are wired for compatibility with LiPo cells and batteries sold for modelling use. Be aware that not all LiPo vendors use the same wiring, you must check before you connect a LiPo. 2 pin and 3 pin JST-PH plugs with 75mm leads for you to make up your own battery. 2 pin and 3 pin JST-PH sockets with 75mm leads for you to make up your own receiver, ESC or charge leads. These adapters are wired for compatibility with LiPo cells and batteries sold for modelling use. Be aware that not all LiPo vendors use the same wiring, you must check before you connect a LiPo. An adapter lead to allow single cell LiPo with 'UM' battery connector to be used on receivers with a JST-PH socket - e.g. the later Parkzone and E-flite micro models such as the mCP-X. 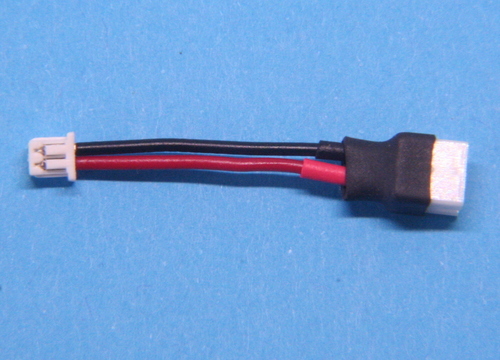 LiPo cells with a UM connector are used on the earlier Parkzone, E-flite and Kyosho models and micro receivers such as the AR6400. An adapter lead to allow single cell LiPo with 2 pin JST-PH battery connector to be used on receivers with a 'UM' socket - e.g. the Spektrum AR6400. LiPo cells with a JST-PH connector are used on the E-flite mCP-X. A short adapter lead to allow 2S Lipos with the red JST 2 pin plug to be used with receivers or ESC that have a JST-PH 3 pin socket - e.g. AR64x0LBL, EFLU4864 and AS6410NBL. An adapter to allow 2S LiPo batteries fitted with the 3 pin JST-PH connector to be charged from a charger or balancer that has JST-XH connectors. 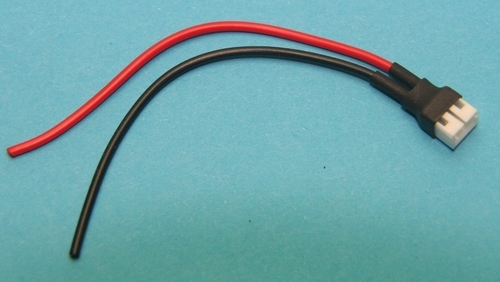 The adapter has 150mm red/black leads for connecting to a charger's main output; these leads either have bare ends for you to fit your own connectors or are available fitted with 4mm plugs that are compatible with the sockets on most LiPo chargers. If your charger has only the JST-XH balance socket or does not require connection to the main charge sockets, then select 'no plugs' below and cut the leads off.